The incredibly talented goat. Goats are curious, creative and unpredictable free spirits; smelling, nibbling and playing with everything in their environment. They eat the leaves and bark of trees by standing on their hind legs and pulling down the branches for all to share. They are renown for their ability to slink through fences and operate gates. 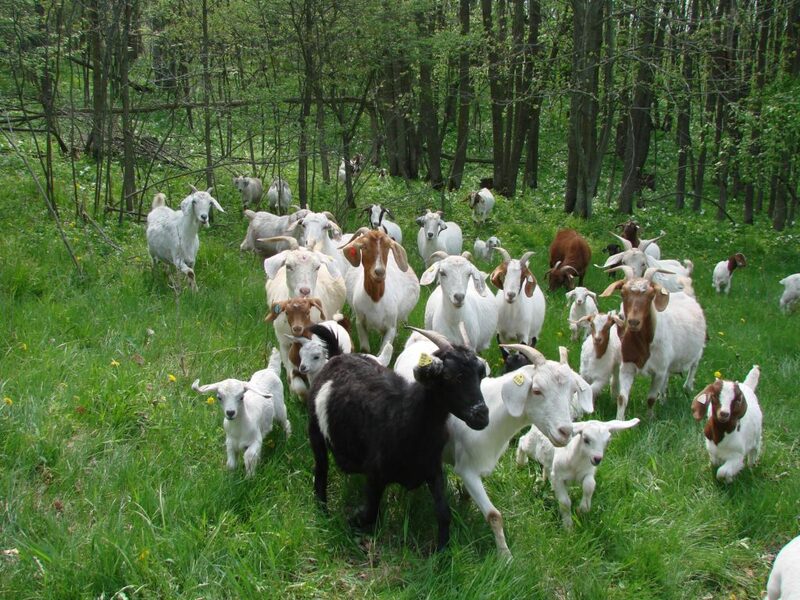 When one goat gets out the rest alert and quickly follow. Although fences may not be able to confine goats easily fences also don’t keep them out. When wary of wandering or alarmed by a predator they immediately return home through the exact opening by which they left. Goats and their kids out on an outing. Delight in the woods. Brush is their food of choice and they much prefer woods to pasture. 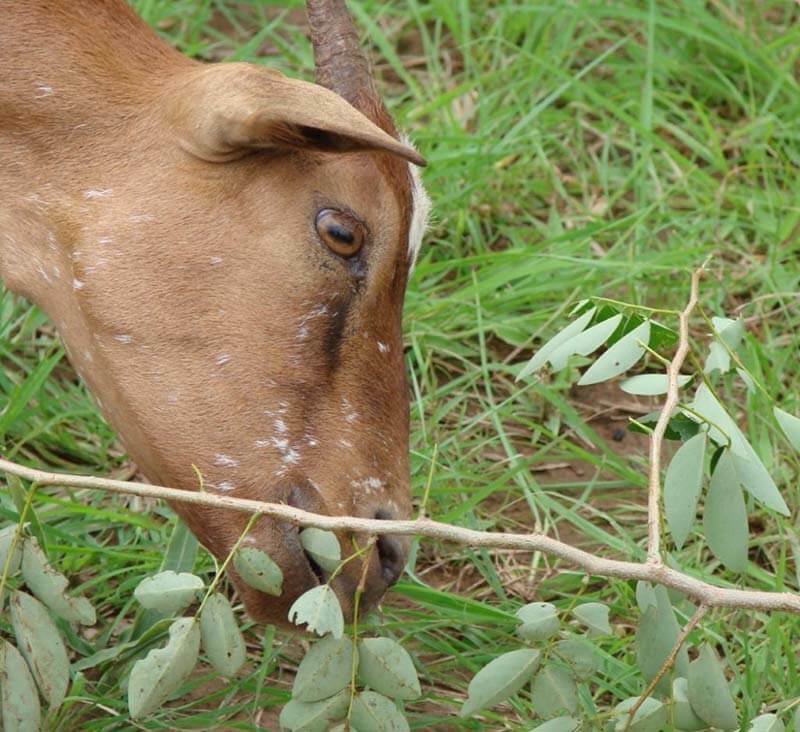 Goats are talented at nibbling nutrient-rich bits of plants that other animals cannot reach or digest. Note the delicate lip work of the doe in the image to the right. Kids (baby goats) gallop in circles, making high, arching jumps and little dances. They jump, slide, toss their heads, whirl on their own axis, spring vertically into trees, leap onto their mother’s backs and get caught in places you would not believe they could get into. They nurse from their moms infrequently and do not follow their moms from place to place as lambs do. When exhausted, they curl into tight little balls and sleep soundly in the hollow of a log or tree, under a hay wagon or alongside their twin. A low, vibrating call from mom will bring the kid running to her side to nurse. If a kid gets into trouble, it screams in a high pitched wail that sounds just like a child screaming. The mom and other females in their group will quickly move to defend it against danger and will take on a dog if necessary. Goats live on cold mountains, savannah brush, sea fronts, deserts, throughout the tropics and are found on all the continents except Antarctica. Their shiny coat reflects sun and protects from heat and humidity better than sheep’s wool. Their soft winter undercoat (called cashmere) keeps them warm in the coldest environments. They thrive in almost as wide a range of temperatures as humans and have lived around and among people since ancient times. Fossil evidence from Jericho (the oldest walled city in the world) shows goats were already domesticated 9,000 years ago. Their continued popularity is partially due to the fact that they can be managed by children, their milk is nutritious and easy to digest, and they provide low-fat, tender meat. Their mohair (produced by Angora goats) and cashmere fiber is used for durable and specialty clothing. Their skins are used even today in some cultures for housing and lightweight, watertight containers so important for families throughout the ages.